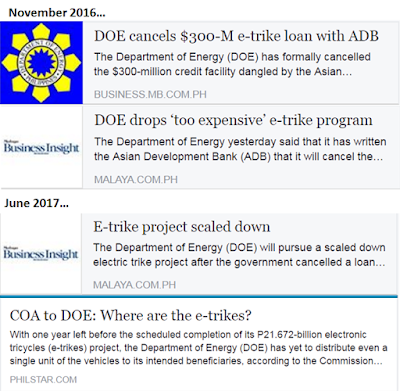 See these news reports about this weird "more tricycles to save the planet" ADB loan. “For the e-trike, I already cancelled the loan – supposedly the funding for 100,000 e-trikes. But for the 3,000 units, since bidding was done and units were already produced by the winning supplier, we’ll go ahead with that – so the canceled loan portion should just be for the 97,000 units,” he explained. The energy department, under the past administration, had just been looking at a price point of R150,000 to R200,000 per e-trike, but unfortunately, the cost subsequently swelled to R250,000 per unit. Last February, Bemac Electric Transportation Philippines Inc., a unit of Uzushio Electric Co. of Japan won the contract to build 3,000 electric trikes worth $30 million. An e-trike costs $10,000 or P500,000 half of which is the cost of battery. Ordinary tricycles cost from as low as P60,000 for second-hand units and upward from P150,000 for the better quality products. The e-trike then costs three times more than the ordinary tricycle. In comparison, new branded vehicles used in ferrying passengers start from P800,000 and they can be bought on instalment with low rates. This time, the e-trike project would involve only 3,000 units of e-trikes from the original plan of 100,000 and the cost is significantly slashed from P21.672 billion to P1.73 billion. The e-trike project was part of the original $504 million e-vehicle project plan jointly funded by the ADB, the Clean Technology Fund (CTF) and the government as part of efforts to jumpstart the energy-efficient electric vehicles industry in the country by producing 100,000 units of electric vehicles. From the $504 million, ADB was supposed to shoulder $300 million while CTF will provide $105 million and the remaining $99 million from the government. In an annual audit report recently published on its website, the COA stated that as of Dec. 31, 2016, only P77,791,419.85 or 0.35 percent of the total project cost of P21.672 billion ($504 million) has been disbursed. Of this disbursed amount, only P14,398,023.17 was allocated for project implementation activities, while P63,393,396.68 was for the payment of commitment charges and interests incurred due to the project’s delayed implementation. The COA said the sustainability of the project is now “in jeopardy” as the cost per unit of the e-trikes has already increased from around P250,000 to currently around P455,000. 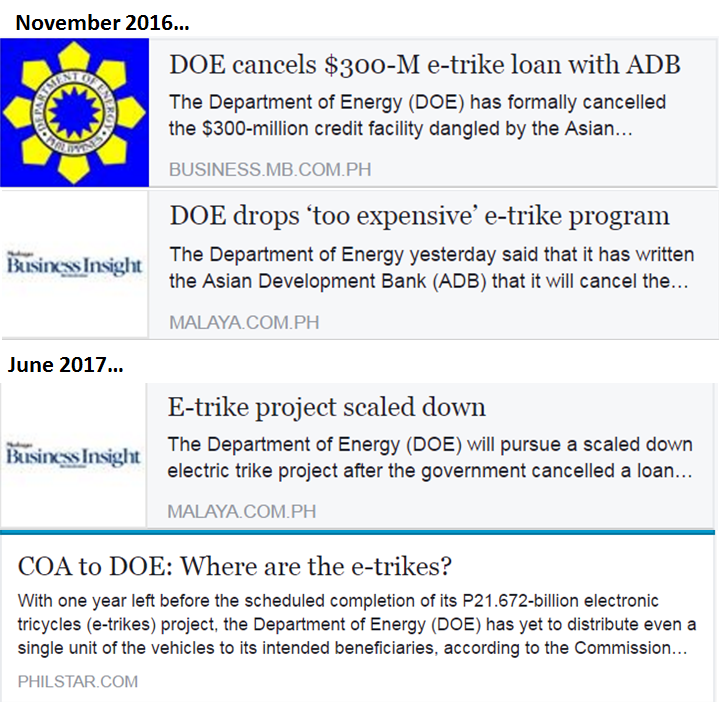 In its reply letter, the DOE management informed the COA that the National Economic and Development Authority Investment Coordination Committee (NEDA-ICC) has approved the DOE’s request for the cancellation of at least $359.76 million worth of ADB loans for the E-Trike Project. DOE Sec. Al Cusi made a good decision in cancelling a big portion of this very lousy, very costly project. We have to pay the commitment fee and save us nearly P21 B. At P455k per e-trike, one cannot even go safely from QC to Las Pinas and back. If battery power runs out due to distance and traffic, there is nowhere to charge for at least 3 hours. Better buy a 2nd-hand car, good running condition with air-con, one can drive up to Baguio, Ilocos or Bicol and back safely. This $400-M e-trikes loan to help 'save the planet from fossil fuel' is a stupid program. Its main function will only be to further expand institutional robbery via loans-then-taxes of Filipino taxpayers.